Assuming there is no agreement reached between congressional legislators and the White House, the partial government shutdown will pass the one-month mark this week. Last Wednesday, President Donald Trump signed legislation guaranteeing back pay to furloughed federal employees, many of whom have already missed a paycheck. There are more than 78,000 federal employees spread across Ohio, according to data from the Bureau of Labor Statistics Quarterly Census of Employment and Wages. In 2017, they earned nearly $6 billion in wages – accounting for 2.25 percent of all wages earned by Ohio workers that year. Federal employees live in every county in Ohio, and it is not a surprise that the larger counties have the greatest number of federal employees, including Cuyahoga (16,191), Franklin (13,141) and Hamilton (8,356). But in smaller Greene County, which is home to both Wright-Patterson Air Force Base and Governor Mike DeWine, 14,047 federal employees account for nearly one-third of all employment in the county. Greene County is an outlier as federal employees accounted for less than 3 percent of wages in nearly all other counties. Federal jobs are generally good jobs meaning excellent benefits, good pay and stable employment. 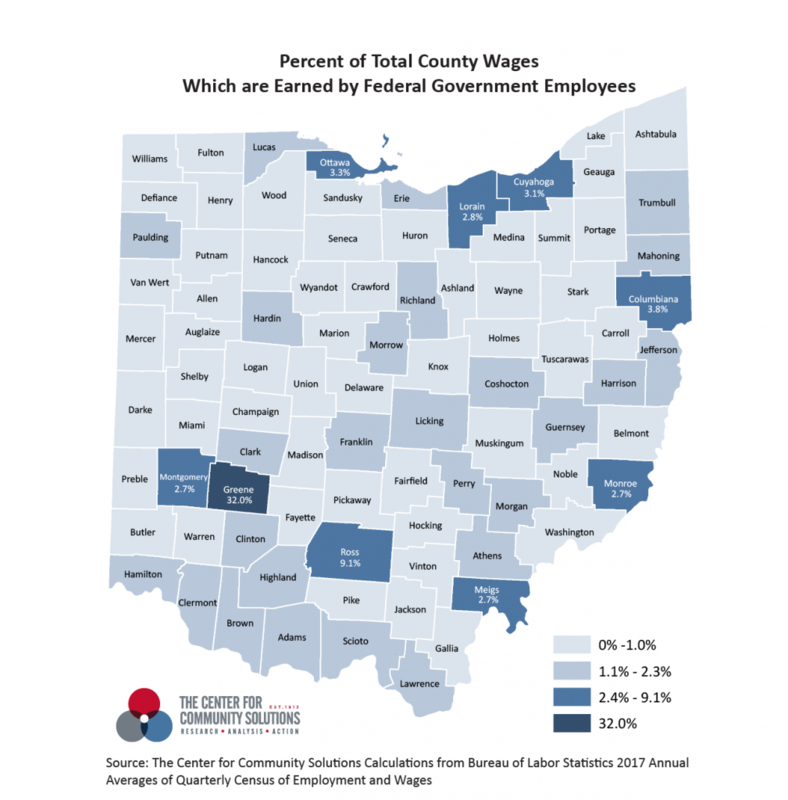 Federal employees’ annual wages are higher than the average pay in 87 of Ohio’s 88 counties. For example, in Lorain County, where the economy has struggled in recent years, the annual wage per federal employee in 2017 was $108,751, that’s 2.5 times as much as the average $42,039 wage per employee in the county as a whole. For Ohio overall, federal employees make, on average, a little more than 1.5 times as much as other employees in the state. The U.S. Census Bureau ceased operations except for planning for the 2020 Census, and funding for that expected to run out in the next few weeks. Only some federal workers have been furloughed, and it is good news that they’ll receive back pay once the federal government is finally full re-opened. In the meantime, the Department of Labor, including the Bureau of Labor Statistics (the source of this data), is funded through the end of the federal fiscal year in September so it is operating as usual. The bureau expects to follow their normal data release schedule. On the other hand, the source of most of the data Community Solutions uses to analyze community conditions, the U.S. Census Bureau, has ceased operations except for planning for the 2020 Decennial Census. And that money is expected to run out in the next few weeks.